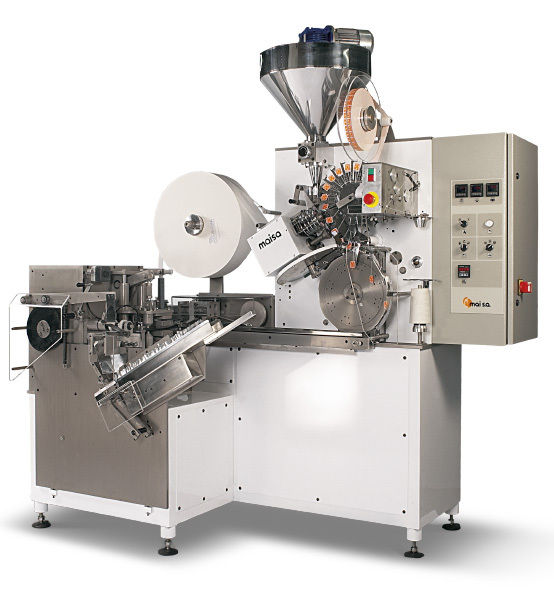 Teabag packing machine with hermetic envelope. 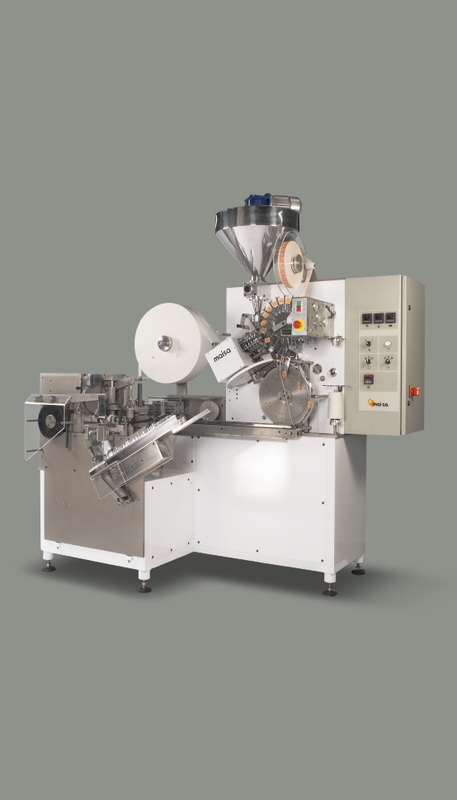 This model is designed for packing tea automatically in filter paper bags with thread, tag and heatsealable envelope material. 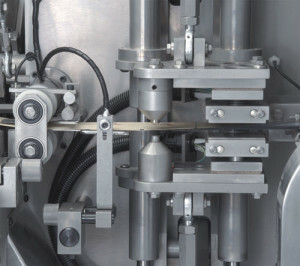 High performance, constant dosage, extreme simplicity and mechanical sturdiness are the most outstanding features of this Packer, result of our long experience in automatic equipments. 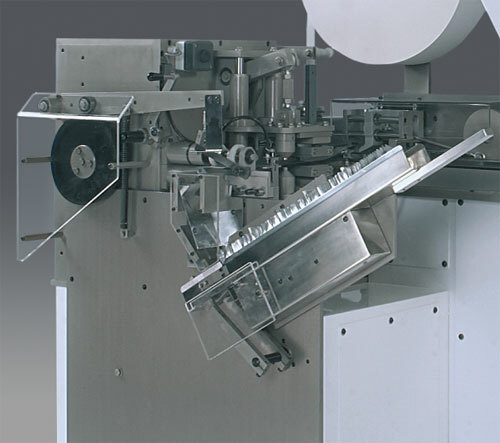 Its design allows the operation and maintenance by normally trained technical personnel. 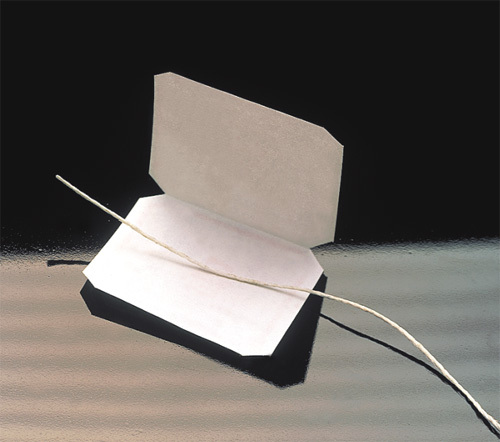 The teabags, with their thread and tag, are introduced into the enveloping material, which is then sealed and cut, forming hermetic envelopes that are presented in counts on the delivery chute, to be packed manually in boxes. 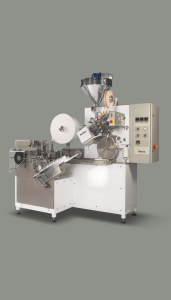 The single chamber tea bag is formed from a roll of heatsealable filter paper, which is folded lengthwise and then closed on three sides by the sealing rollers. 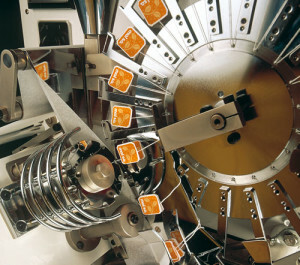 The previously dosified product is introduced simultaneously. The tags, printed only on one side, are cut two at a time and folded over the thread, ensuring their attachment to it with a drop of vinylic glue. The other end of the thread is joined to the tea bag during the sealing procedure, eliminating the traditional metal staples. • It preserves the flavour: It solves a problem, specially with flavored and fruit teas, where time spoils the quality of the product. • It protects from humidity: It ensures the conservation of the product from the packing to the moment it is consumed. • It positions and gives hierarchy: It grants the possibility of placing your best products in the market, distinguishing them from the others by means of a high quality packaging. The EC12Y/C-MP and EC12L/C-MP model have been specially designed when more volume needs to be packed. 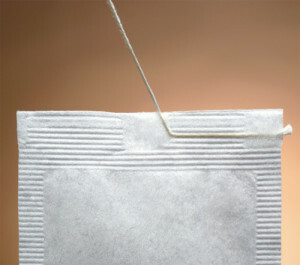 The content of the teabags can reach a maximum of 10 cm3 and 15 cm3 respectively. According to customers’ request and attending to the needs of the market, MAISA CE line of Packers fulfills all the requirements of the Rules applied by the European Community. 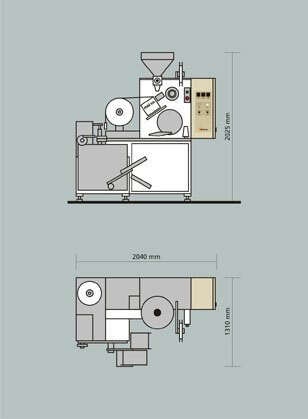 DC120 Auger Filler: Designed for packing other infusions that are difficult to dosify, as coffee, for example. 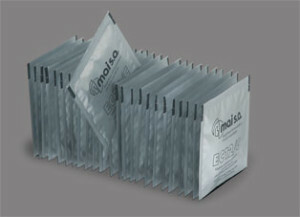 Its design allows an easy assembling on the upper part of the MAISA Packers. RM1 Herb Stirrer: Used for packing aromatic herbs or products that are hard to dosify. PCA Safety Guards: Designed with the double purpose of protecting the system during the packing process and increasing the safety of the operator when the equipment is running. (EC12Y/C-MP: 110 teabags per minute EC12L/C-MP: 100 teabags per minute). (EC12Y/C-MP: 63 mm x 60 mm EC12L/C-MP: 63 mm x 70 mm). (EC12Y/C-MP: 82 mm x 75 mm EC12L/C-MP: 82 mmx85mm). Approximately 6 cm3 (maximum) up to 2.2 g of BOP or Fannings black tea. (EC12Y/C-MP: 10 cm3 EC12L/C-MP: 15 cm3). 3 x 220 V / 380 V (others upon request). 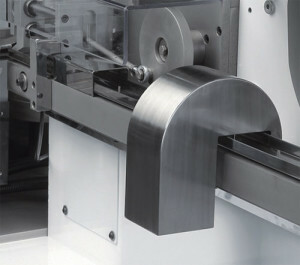 20 l/min at 4 BAR.